Villa Rama Sita is hidden in the heart of Seminyak you’ll find a villa embodying the spirit of its namesakes Rama and Sita. These Hindu legends were lovers of great beauty and their spirits are certainly present in this stunningly renovated three bedroom pool villa. Enclosed in an arena of tropical plants you’ll find peace and tranquility in the tropical air as you lounge under the high pavilion ceilings and take in the smart, modern décor of Villa Rama Sita. The focus of the sprawling living area is the sparkling pool which is just perfect for floating in the warm sun. 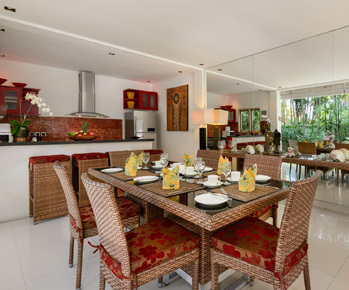 Of course the villa has a full service kitchen and you’ll love the manicured garden with its statues and tropical plants. Each bedroom is luxuriously appointed with airconditiong and designed with every comfort in mind. The staff members are poised and ready to help with any extra requests you may have. They consist of a villa supervisor, gardener and pool service attendant as well as a daily housekeeping service so you don’t have to worry about a thing while you’re on holiday. Start from USD 255 Nett.